Book Synopsis: Rowland Sinclair is an artist and a gentleman. In Australia’s 1930’s, the Sinclair name is respectable and influential, yet Rowland has a talent for scandal. A FEW RIGHT THINKING MEN introduces Rowland Sinclair to fans of Australian historical crime fiction. Set in 1930’s Sydney and Yass, A FEW RIGHT THINKING MEN takes a reader into a world where the affects of the Great Depression are being felt, and the tension between the Proto-Fascists and Communists in Australian society veers dangerously close to civil war. Not that the central character of this novel, Rowland Sinclair, is feeling any of the Depression affects. He is the youngest son of an extremely wealthy, influential farming family. His oldest brother runs the farm on a day to day basis, the middle brother was killed in the First World War. A painter, he lives in the family mansion in Sydney, along with a selection of his closest artist friends. Under his patronage, although it’s really more friendship and generosity, they lead a life of luxury, privilege and ease. That doesn’t stop them mixing with Communist elements – committed or fringe-dwellers. When Rowland’s uncle (of the same name) is bashed in his home and dies, Rowland returns to the family homestead for the funeral and a visit over Christmas with his mother, brother and sister-in-law. He finds his mother more and more mentally disturbed by the loss of her middle son, and his brother deeply involved with the New Guard. The New Guard was a mostly NSW, Sydney-centric proto-fascist movement committed to fighting the perceived “Communist threat”. The Old Guard boasted a similar philosophy but were altogether more shadowy and militant. Both these movements were convinced that armed rebellion against the communists was required, and New Guard actively campaigned the overthrow of the then NSW Premier Jack Lang. For those interested in these things, the man who cut the ribbon at the opening of the Sydney Harbour Bridge before the Premier could, Captain Francis de Groot, was a member of the New Guard… but I digress. A FEW RIGHT THINKING MEN is set in a very short period of Australian history when open rebellion was discussed and enmity and mistrust held very close to hearts. The battles between the Old and New Guard, the Communists, and sympathisers from all sides are covered within the context of this book, which has, at the heart of it a fairly simple murder plot. Even though Rowland Sinclair, the elder, is bashed to death, the death is mostly handled delicately and there’s very little dwelling on the events and/or details. Where this book is very strong is in the clarity of the events that it describes, the way that the characters of Rowland and his friends are seamlessly woven into a true history, and the manner in which this period in Australia is described. Not that this is a heavy, hard-work historical novel. The characters are wonderfully drawn. Rowland and friends are eccentric, but not overly so, they fit within that period of history well. The members of the New and Old Guard’s are nicely shadowy, dedicated to the cause, slightly mad in their own right, but not cartoonish or overdone. There are light touches of humour, and there are some sad moments – the loss of Rowland the elder, the descent of Rowland’s mother into complete madness are deftly drawn. 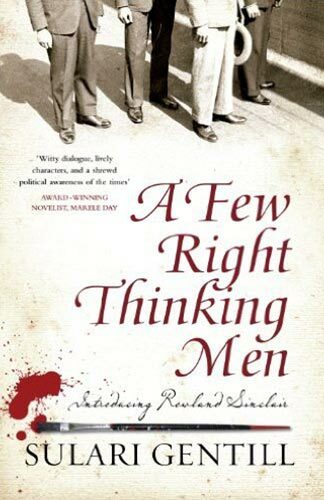 A FEW RIGHT THINKING MEN would be a good book for readers who like their murder and mayhem more on the incidental side. It’s not that hard to pick the why very early on, and the who narrows down as events progress. But the murder doesn’t read as the point of this book. It’s the overall environment, and that short, sharp, mad period of Australian history, which is really very well handled.